Do you love using your crock pot or slow cooker? I’m a huge fan of my crock pot. Especially on night where we are either running to gymnastics or dance after school. I love knowing that my family will get to share a home cooked meal together even though our afternoons can get absurdly busy. 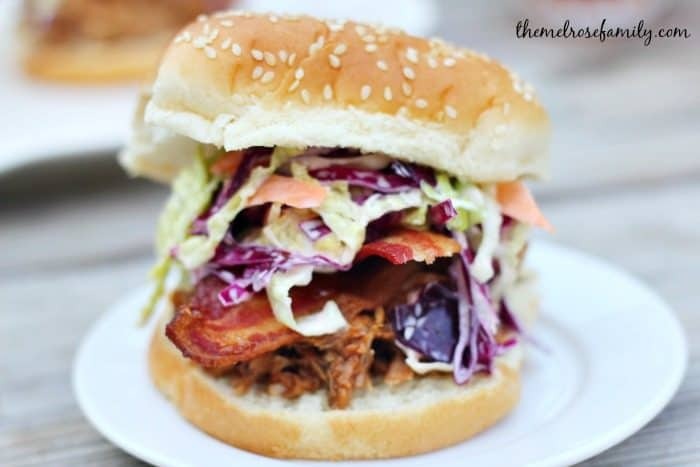 These Bacon Pulled Pork Sandwiches are the perfect, busy weeknight crock pot meal. I personally love walking into a home that the smell of dinner is in the air. My slow cooker pulled pork recipe definitely leaves that smell in the air. My recipe is a rather traditional, easy recipe so I decided to reimagine it with a little Southern flair. Since moving down south, I routinely see foods with cole slaw on them on the menus in the local restaurants. In NY there are tons of great restaurants, but not many restaurants that understand barbecue like they do down south. It seems to be a territorial idiosyncrasy. I was actually quite surprised by how much I truly enjoy cole slow on my food. Our Carolina Slaw Dogs with a Twist are a perfect example of that. 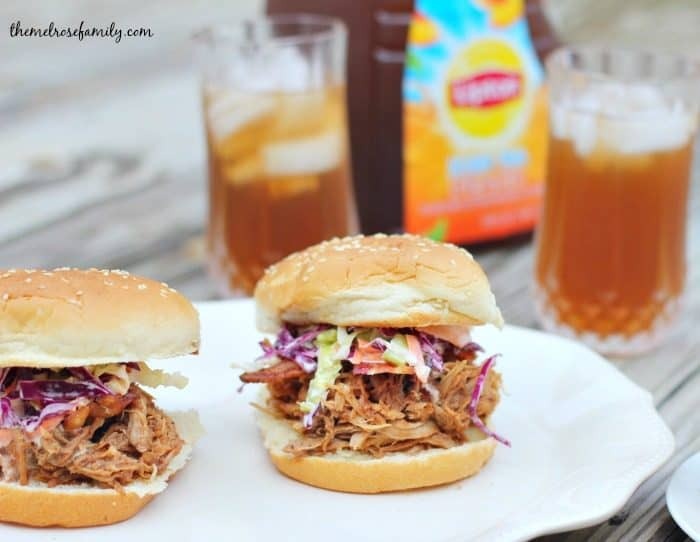 These pulled pork sandwiches are not only topped with cole slaw. They also have the family favorite of bacon. You really can’t mess up a recipe when you use bacon as an ingredient. 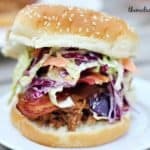 This reimagined Bacon Pulled Pork Sandwich takes combines the smokiness of the barbecue pulled pork with the saltiness of the bacon and the crisp sweetness of the cole slaw and just knocks your tastebuds out of the park. It is the perfect meal to enjoy with my family during a crazy busy week while enjoying a cold glass of Lipton Peach flavored iced tea. I grew up in a house where Lipton iced tea was present each and every day. If it wasn’t then there was clearly something wrong. Even as an adult I can remember tons of family dinners with all of the grandkids present too where we would chat about our days while enjoying a glass of Lipton iced tea. There would be plenty of noise, but it was the noise of family. I want the same for my family which is why I’m excited that Lipton has teamed up with Food Network to reimagine classic recipes to enjoy them together. Do you love using your crock pot? 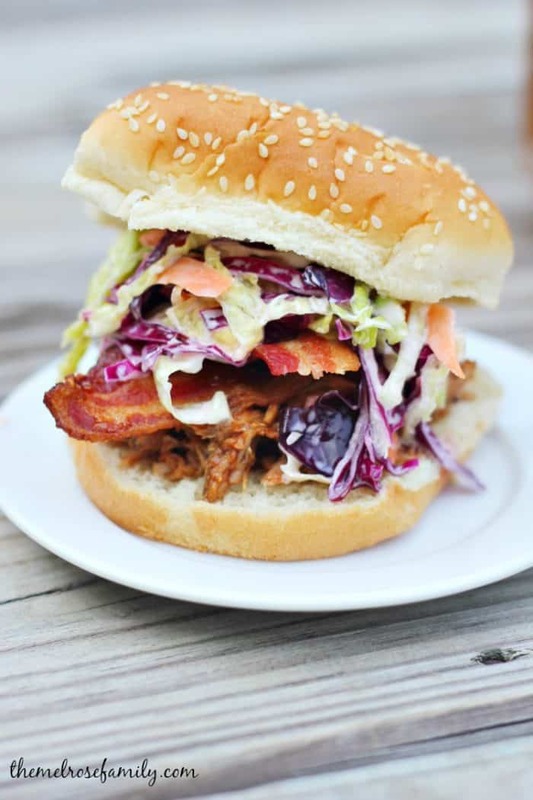 These reimagined Bacon Pulled Pork Sandwiches topped with cole slaw are the perfect weeknight meal. Prepare the slaw by combining the cabbages, carrots and onion. Add in the mayonnaise, vinegar, sugar and oil and mix well. 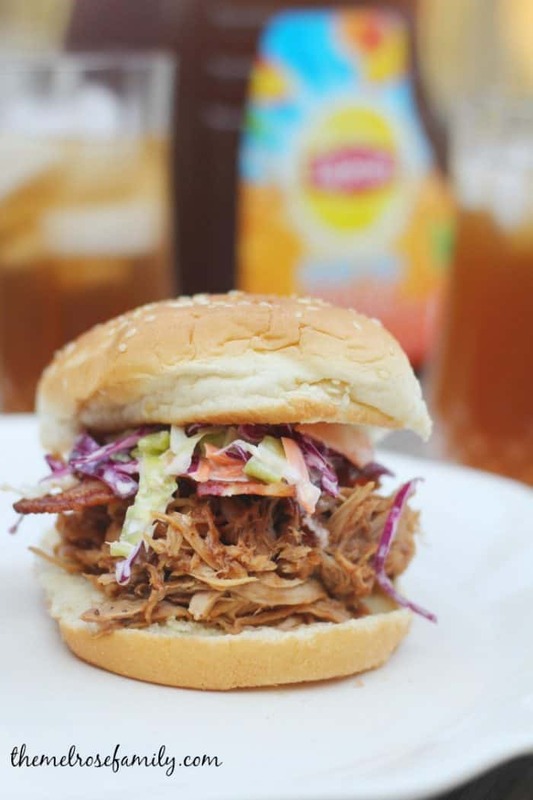 Refrigerate the slaw while the pulled pork cooks in the slow cooker. 20 minutes before serving cook the bacon so that it is crispy. On each roll place the pulled pork, two slices of bacon and cole slaw. Makes 8 -12 servings depending upon the size of the pork. This looks absolutely delicious! I will definitely be making this for diner tomorrow! Thank you for sharing!